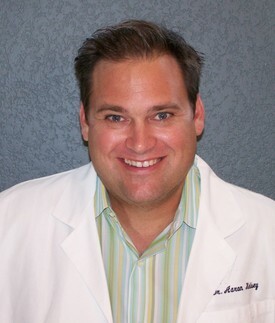 Dr. Aaron Kelsey moved from Newport Beach to La Quinta with his wife and two children in January of 2006. La Quinta is a stellar community and he wanted to build a dental practice that would reflect his own patient-centered sensibilities. Dr. Kelsey enjoys spending time with his family and new found friendships. Also, quick trips to the coast to surf are never out of the question. Dr. Kelsey is a 2005 graduate of the University of the Pacific School of Dentistry in San Francisco. UOP is a premiere school for clinicians due to the absence of specialty residents. No other institution offers such a high level of surgical training for their pre-doctoral students. What this means for Dr. Kelsey's patients is that almost every procedure is performed in his practice to the level of a specialist. If you do require a referral than Dr. Kelsey will communicate with the specialist to achieve very specific goals and expected outcomes. Dr. Kelsey is an active member of the American Academy of Cosmetic Dentistry, American Dental Association, and the California Dental Association. Dr. Kelsey will, along with his staff, attend multiple meeting's and workshops throughout the year to ensure that he and his practice are absolutely state of the art. Dr. Kelsey approaches dentistry in a very intimate fashion. Communication and one on one attention are criteria that are ALWAYS satisfied in his practice. Whether it's a simple exam and cleaning or a complex smile makeover his thoughtful and intelligent care is the foundation for a great patient experience. Come on by and re-discover that good old chairside manner.